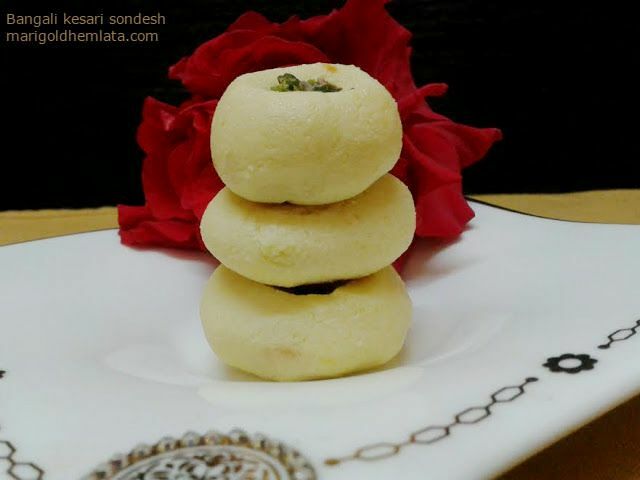 Sondesh is a sweet and delicious Bengali dessert which is made from fresh chena. Sondesh is a delicacy served as a dessert, made by several different ways using freshly made chena, sugar, flavored with cardamom powder. Here i am using saffron for making it. Soak the saffron strands in 2 tbsp warm milk, keep aside. Boil the milk over medium heat. Add lemon juice and stir the milk curdles. Strain and immediately refresh the milk solids in cold water. Now put the chhenna in muslin cloth and squeeze till all the water is drained out. Knead it like a dough with the heel of your palm until smooth, it will take around 10 minutes. Add saffron, sugar and cardamom powder. Mix well and knead again for 5 minutes. Cook the mixture in a non stick pan for 5 to 6 minutes over medium flame. Remove from heat and divide the mixture in equal portion. Make 12 sondesh. Make a small hole on top and place the pistachio on it. refrigerate.